WASHINGTON -- U.S. consumer sentiment rebounded strongly in early October, suggesting that the economic recovery remained on track despite headwinds from a strong dollar and weak global demand that have weighed on the industrial sector, particularly manufacturing. The snapback in sentiment reported Friday underscored robust domestic demand and offered hope that consumer spending would remain solid enough to support economic growth, which has slowed significantly in recent months. The University of Michigan said its consumer sentiment index rose to 92.1 in early October from a reading of 87.2 September. The survey's current conditions sub-index shot up to 106.7 this month from 101.2 in September. %VIRTUAL-pullquote-This suggests that U.S. household sentiment has turned an important corner...%The index at current levels has historically been consistent with roughly a 4 percent annualized rate of consumer spending growth, according to economists. "This suggests that U.S. household sentiment has turned an important corner, and is a hopeful sign on the outlook for consumer spending activity going forward, given signs of weakness in other parts of the economy," said Millan Mulraine, deputy chief economist at TD Securities in New York. The rise in sentiment, which likely reflected cheaper gasoline prices, suggested limited impact from recent stock market volatility. Consumers were the most optimistic about their personal financial expectations since 2007. Their views toward purchases of long-lasting manufactured goods were equally bullish. Consumer spending accounts for more than two-thirds of U.S. economic activity and has been the bright spot in the economy as the industrial sector wobbles under the onslaught of slowing global growth and the resurgent dollar, which have eroded demand for U.S. manufactured goods. It is also being weighed down by lower energy oil prices that have undercut capital investment in the energy sector, as well as an effort by businesses to whittle down their inventories. U.S. stocks were trading higher Friday, while prices were U.S. Treasuries were mostly weaker. The U.S. dollar rose against a basket of currencies. In a separate report, the Federal Reserve said industrial output slipped 0.2 percent on renewed weakness in oil and gas drilling after slipping 0.1 percent in August. Industrial production rose at an annual rate of 1.8 percent in the third quarter. "We do not expect the recent slowing to lead to a broader pullback in aggregate growth, as service sector activity remains solid," said Jesse Hurwitz, an economist at Barclays in New York. Manufacturing accounts for about 12 percent of the U.S. economy. Still, the weak industrial production report added to soft trade, retail sales and employment data that have pointed to a significant slowdown in growth after the economy expanded at a 3.9 percent annual pace in the second quarter. Third-quarter growth estimates are currently around a 1.5 percent rate. Slower growth and low inflation have diminished expectations of an interest rate hike from the Fed this year. Manufacturing output fell 0.1 percent in September even though robust demand for automobiles lifted motor vehicle and parts production by 0.2 percent. 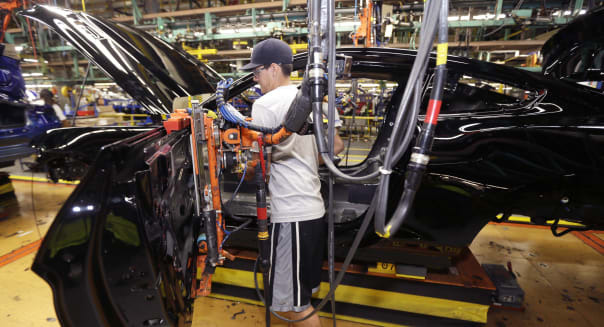 Manufacturing output dropped by 0.4 percent in August. For the third quarter, manufacturing output increased at a rate of 2.5 percent. There were declines in the production of computer and electronic products, as well as electronic equipment, appliances and components. Primary metals and machinery output increased. Mining production fell 2 percent as oil and gas well drilling tumbled 4 percent after increasing for two straight months. An almost 60 percent plunge in oil prices since June 2014 has hurt the profits of oil-field companies such as Schlumberger (SLM) and Halliburton (HAL), leading to deep cuts in their capital spending budgets. Utilities production increased 1.3 percent in September. With output declining, industrial capacity use fell to 77.5 percent from 77.8 percent in August. The lackluster industrial production picture was reflected in a swathe of manufacturers' results Friday, with General Electric (GE) and Honeywell International (HON) reporting drops in revenue along with profits that were better than forecast.